A picture can say a thousand words. 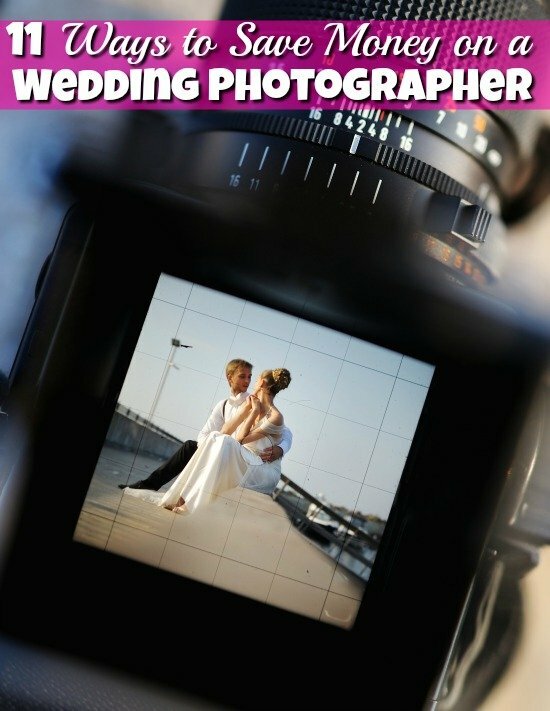 For most couples, getting a wedding photographer is one of the most important aspects of the wedding process. You want someone that is going to capture the memory you will have for a lifetime. Though this can be a costly endeavor, and when you are on the hunt for cheap wedding ideas for a wedding photographer there aren't a whole lot of tips out there! Check my 11 best tips to save on the wedding pictures! First, let me tell you not every time will work for everyone. That's ok! take what works for you and your weddings, your budget, your family and leave the rest. I hope you find at least one tip to help out. If you are on a super tight budget, I recommend the book How to Have Your Dream Wedding for Under $1,500. Now on to the tips! Decide on a budget. It is always good to have a budget for each aspect of your wedding. Decide how much you actually want to spend on your pictures. Book in advance. It can actually be to your benefit to booking a photographer first. Many photographers will offer discounts for early booking. Go digital. Having the company print all your pictures for you can get pricey. It may seem a little more to buy digital rights to your pictures, but it will save you a lot more in the long run. Think hourly. If you want to save money, hiring a photographer for fewer hours will save you a lot of money. Narrow down the time you want the photographer to be there. I placed disposable cameras in each table to capture those candid moments. (this was almost 10 years ago before the phone camera was a big thing) Many of those pictures I like better than the ones I got from my photographer. So I think you only need the ‘professional' when you want the traditional pictures. Think about others. If you know, a friend or family member that may be getting married soon ask the photographer about referral discounts. You may be able to get a discount just for thinking of others. Look for local photographers. Big corporations are going to charge a lot more than a local small town photographer. Look into smaller companies with great pictures. Do your research. Don’t just check out a few places. Call around, look at pictures, and have several options to choose from. The more options you have, the more you can save. Ask for a price match. If you really like a photographer, but another photographer is offering the same package at a better price, ask for a price match. Many times a photographer will honor the price of another to get you as a client. Get contributions from family members. You can add your photography to your gift registry and ask for family and friends to gift you with pictures of your wedding. This will cut down cost and allow you to choose more expensive options. Consider a newbie. Even those just starting out will have a portfolio for you to look at. Consider hiring a student from a local college who needs experience or a photographer just starting out. Look Around. Take a look around you, any friends or family that have budding photography skills? Ask them to take pictures, and I'm sure they would love to get the experience under their belt. Getting your perfect photos for a memory of a lifetime is most important. What other tips do you have for saving money on a wedding photographer? Here are some more of our great cheap wedding idea tips.